A modern version of a cabled fisherman sweater with a nod to the 1960s beatnik in its boat neck and fitted shape. Knit in a super soft recycled and wool-free tweed. The yarn is surprisingly lighter than you'd expect from the tweedy look, but the silk content means it's still cozy enough to keep you warm on cool fall days and nights. All Rows or Rounds: [K1 tbl, p1 tbl] to end. Rows 1-2: [K1, p1] to end. Rows 3-4: [P1, k1] to end. Repeat Rows 1-4 for Moss Stitch. RT (Right Twist): K2tog, but do not drop sts from left needle; k into front loop of first st on left needle, drop both sts from left needle. C4BP: Slip 2 sts to cable needle and hold to back of work; k2 from left needle, p2 from cable needle. C4FP: Slip 2 sts to cable needle and hold to front of work; p2 from left needle, k2 from cable needle. C5B: Slip 3 sts to cable needle and hold to back of work; k2 from left needle, slip last st from cable needle to left needle and k tbl; k2 from cable needle. C5F: Slip 3 sts to cable needle and hold to front of work; k2 from left needle, slip last st from cable needle to left needle and k tbl; k2 from cable needle. C6BP: Slip 2 sts to cable needle and hold to back of work; k4 from left needle, p2 from cable needle. C6Bkp: Slip 2 sts to cable needle and hold to back of work; k4 from left needle, [k1, p1] from cable needle. C6Bpk: Slip 2 sts to cable needle and hold to back of work; k4 from left needle, [p1, k1] from cable needle. C6FP: Slip 4 sts to cable needle and hold to front of work; p2 from left needle, k4 from cable needle. C6Fkp: Slip 4 sts to cable needle and hold to front of work; [k1, p1] from left needle, k4 from cable needle. C6Fpk: Slip 4 sts to cable needle and hold to front of work; [p1, k1] from left needle, k4 from cable needle. C6B/RT: Slip 2 sts to cable needle and hold to back of work; [p1, RT, p1] from left needle, k2 from cable needle. C6BP/RT: Slip 2 sts to cable needle and hold to back of work; [p1, RT, p1] from left needle, p2 from cable needle. C6F/RT: Slip 4 sts to cable needle and hold to front of work; k2 from left needle, [p1, RT, p1] from cable needle. C6FP/RT: Slip 4 sts to cable needle and hold to front of work; p2 from left needle, [p1, RT, p1] from cable needle. Directions for whip stitch can be found here. 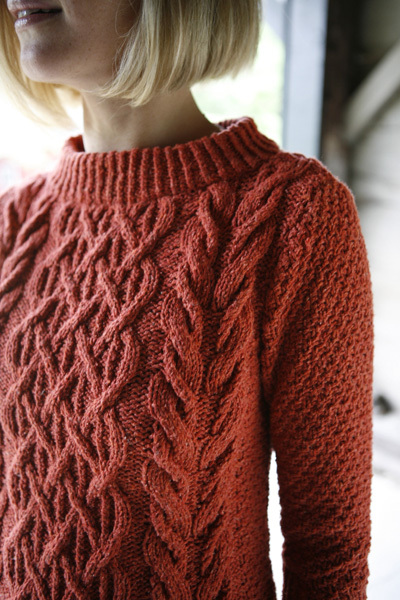 Editor's note: I'm knitting this sweater and needed a color key to follow the charts. 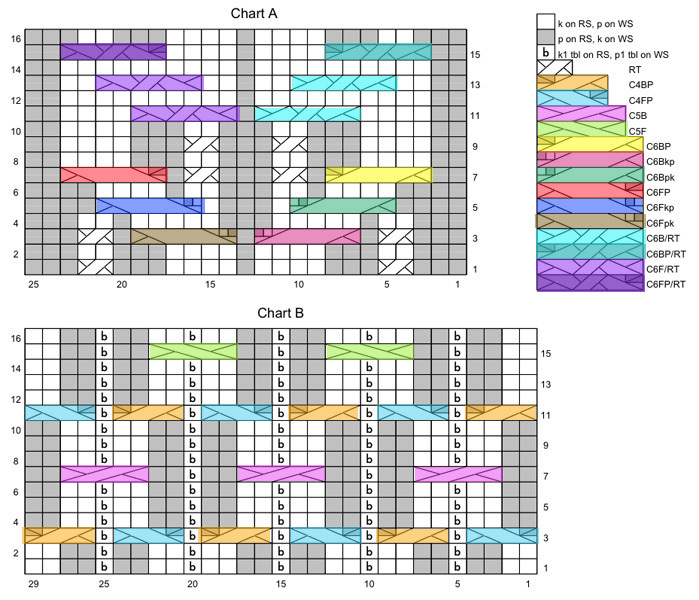 So I'm making the color-coded version of the chart available for you, too. Click here. Using smaller straight needles, CO 78[90, 98, 110, 118, 130, 138] sts. Work in Twisted 1x1 Rib until work measures 2.5 inches, ending with a RS row. Next Row [WS]: P6[12, 16, 22, 26, 32, 36], place marker, [m1p, p5, m1p, p6] six times, m1p, place marker, p6[12, 16, 22, 26, 32, 36]. 91[103, 111, 123, 131, 143, 151] sts; 79 sts between markers. Set-up Row [RS]: Work in Moss Stitch to first marker, slip marker, work Row 1 of Chart A, work Row 1 of Chart B, work Row 1 of Chart A, slip marker, work in Moss Stitch to end. This row sets pattern for back. Continue in pattern until work measures 3.5[3.5, 4, 4, 4, 4, 4] inches, ending with a WS row. Waist Decrease Row [RS]: K1, k2tog, work in pattern to last 3 sts, ssk, k1. Work 5 rows in pattern. Repeat these 6 rows twice more, then work Waist Decrease Row once more. 83[95, 103, 115, 123, 135, 143] sts. Continue in pattern until work measures 12.5[12.5, 13, 13, 13, 13, 13] inches, ending with a WS row. Waist Increase Row [RS]: K1, m1, work in pattern to last st, m1, k1. Work 3 rows in pattern. Repeat these 4 rows twice more, then work Waist Increase Row once more. 91[103, 111, 123, 131, 143, 151] sts. Continue in pattern until work measures 15.5[15.5, 16, 16.5, 16.5, 17, 17] inches, ending with a WS row. BO 4 sts at beginning of next -[-, -, 2, 2, 4, 4] rows. -[-, -, 115, 123, 127, 135] sts. BO 3 sts at beginning of next 2[4, 4, 2, 4, 4, 4] rows. 85[91, 99, 109, 111, 115, 123] sts. BO 2 sts at beginning of next 4[2, 4, 4, 4, 2, 4] rows. 77[87, 91, 101, 103, 111, 115] sts. BO 1 st at beginning of next 4[4, 4, 6, 4, 4, 4] rows. 73[83, 87, 95, 99, 107, 111] sts. 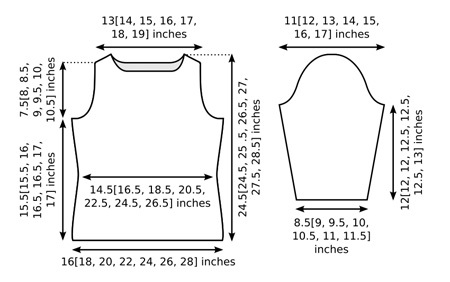 Continue in pattern until work measures 23[23.5, 24.5, 25.5, 26, 27, 27.5] inches (7.5[8, 8.5, 9, 9.5, 10, 10.5] inches from beginning of armhole shaping), ending with a WS row. Row 1 [RS]: BO 4[6, 6, 6, 6, 8, 8] sts, work in pattern until there are 22[24, 24, 28, 28, 30, 30] sts on right needle; join second ball of yarn, BO next 21[23, 27, 27, 31, 31, 35] sts, work in pattern to end. Note: In the directions that follow, a semi-colon will indicate a break between the two sets of sts, each set with its own ball of yarn attached. Row 2 [WS]: BO 4[6, 6, 6, 6, 8, 8] sts, work in pattern to end of first set of sts; BO 7 sts, work in pattern to end. Rows 3-4: BO 4[5, 5, 7, 7, 8, 8] sts, work in pattern to end of first set of sts; BO 7 sts, work in pattern to end. Row 5 [RS]: BO remaining 4[5, 5, 7, 7, 8, 8] sts of first set of sts; BO 7 sts, work in pattern to end. BO remaining 4[5, 5, 7, 7, 8, 8] sts. Work as for back until work measures 2 inches less than back to beginning of shoulder/neckline shaping, ending with a WS row. Row 1 [RS]: Work 26[30, 30, 34, 34, 38, 38] sts in pattern; join second ball of yarn, BO next 21[23, 27, 27, 31, 31, 35] sts, work in pattern to end. 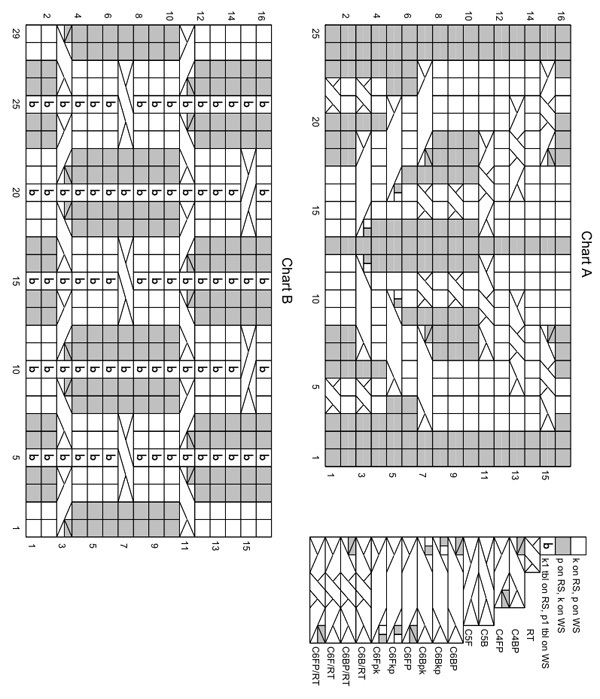 Two sets of 26[30, 30, 34, 34, 38, 38] sts, each set with its own ball of yarn attached. Rows 2-3: Work first set of sts in pattern; BO 6 sts, work in pattern to end. 20[24, 24, 28, 28, 32, 32] sts in each set. Rows 4-5: Work first set of sts in pattern; BO 4 sts, work in pattern to end. 16[20, 20, 24, 24, 28, 28] sts in each set. Rows 6-7: Work first set of sts in pattern; BO 2 sts, work in pattern to end. 14[18, 18, 22, 22, 26, 26] sts in each set. Rows 8-11: Work first set of sts in pattern; BO 1 st, work in pattern to end. 12[16, 16, 20, 20, 24, 24] sts in each set. At end of Row 11, work should measure same as back to beginning of shoulder shaping. Rows 12-13: BO 4[6, 6, 6, 6, 8, 8] sts, work in pattern to end. Rows 14-15: BO 4[5, 5, 7, 7, 8, 8] sts, work in pattern to end. Row 16 [WS]: BO remaining 4[5, 5, 7, 7, 8, 8] sts of first set of sts; work in pattern to end. Using smaller straight needles, CO 42[44, 46, 50, 52, 54, 56] sts. Work in Twisted 1x1 Rib until work measures 3 inches, ending with a RS row. Switch to larger needles and p 1 row, evenly decreasing 4 sts. 38[40, 42, 46, 48, 50, 52] sts. Work 6 rows in Moss Stitch, ending with a WS row. Increase Row [RS]: K1, m1, work in pattern to last st, m1, k1. Work 7[5, 5, 5, 5, 3, 3] rows in pattern. Repeat these 8[6, 6, 6, 6, 4, 4] rows 4[5, 6, 7, 8, 3, 4] times more, then work Increase Row once more. 50[54, 58, 64, 68, 60, 64] sts. Repeat these 6 rows 5 times more. -[-, -, -, -, 72, 76] sts. Continue in pattern until work measures 12[12, 12, 12.5, 12.5, 12.5, 13] inches or desired length to underarm, ending with a WS row. BO 3 sts at beginning of next 2 rows. 44[48, 52, 58, 62, 66, 70] sts. BO 2 sts at beginning of next 2 rows. 40[44, 48, 54, 58, 62, 66] sts. Next Row [RS]: K1, k2tog, work in pattern to last 3 sts, ssk, k1. Repeat these 2 rows 7[8, 10, 11, 13, 14, 15] times more. 24[26, 26, 30, 30, 32, 34] sts. BO 2 sts at beginning of next 2 rows. 20[22, 22, 26, 26, 28, 30] sts. BO 3 sts at beginning of next next 2 rows. BO remaining 14[16, 16, 20, 20, 22, 24] sts. Using circular needle, beginning at center back and with RS facing, pick up and k approx. 100[100, 108, 108, 112, 112, 116] sts around neckline. Place marker and join to work in the round. 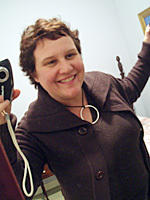 Work in Twisted 1x1 Rib until collar measures 4 inches. Loosely BO all sts. Fold to WS and loosely whip stitch BO edge of collar to WS of picked-up row of sts. Weave in ends. Sew sleeves into armholes. Sew sleeve seams and side seams. 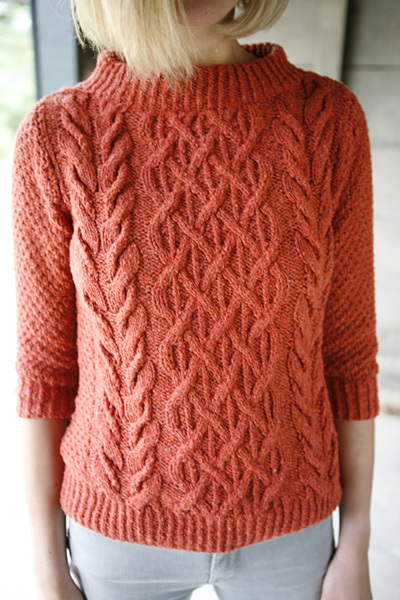 Norah Gaughan is the design director at Berroco, the author of Knitting Nature, and the co-author of Comfort Knitting and Crochet Afghans. 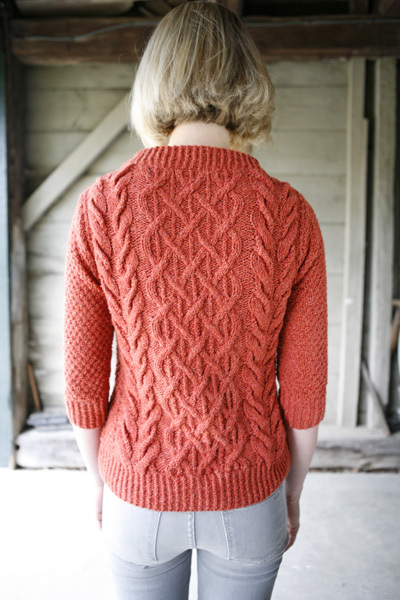 Her newest self-titled volume, Norah Gaughan volume 7, is in your LYS now.